Provenance: an American collection; previously Japan. The ewer is finely potted in a compact ovoid form with an upright tubular spout on the shoulder opposite a rounded double-strand loop handle embellished with double buttons. The ewer is covered with a minutely crackled ivory-white glaze of even tone and handsome gloss. Beneath the slightly flared foot the flat unglazed base reveals the compact white body that is relatively free of impurities. Related ewers are discussed in a lengthy compilation and study of tea utensils in China throwing new light on such wares.1 It is so natural to assume ewers were intended as wine vessels that to see an entire group discussed as tea wares is enlightening. Some have suggested that the pots were used for brewing and pouring tea, others that the vessels were for hot water that would be poured onto the powdered tea that had been scooped into a tea bowl. That white-ware ewers would be used for this purpose makes some sense when considering that the white bowls produced at the Xing kiln in Hebei province were among the most appreciated and coveted of wares during the Tang for use in tea-drinking. The discovery of such ewers in 9th-century late Tang-period tombs, and related material from the Beilitung shipwreck of the 9th century, supports the dating of the present example. Towards the end of the 6th century A.D., potters began taking advantage of the white clays in southern Hebei province and began a journey in technology and creativity that would lead to the legendary Xing ware of the Tang dynasty and ultimately to one of the greatest ceramic products of China and the world, the Ding wares of the Song dynasty. 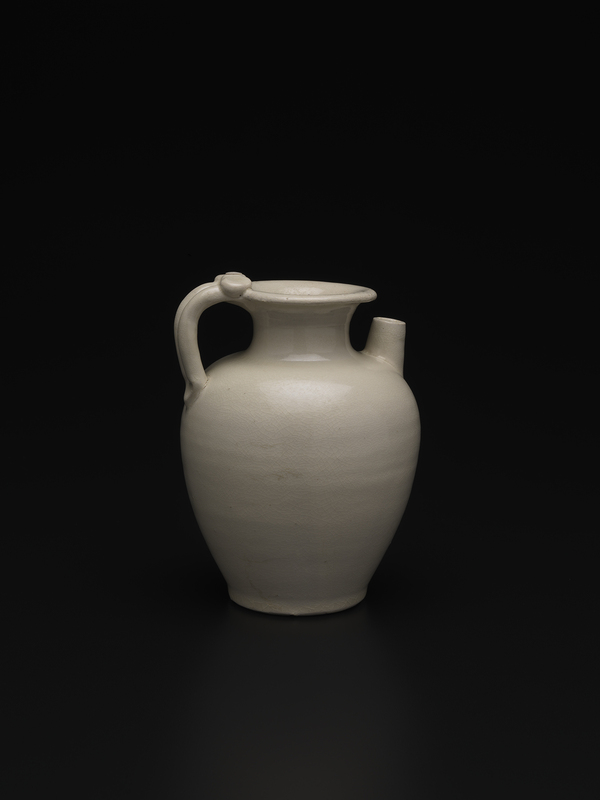 The producers of white wares in Hebei, and at kilns following suit in Henan province, had provided from the outset important accoutrement for drinking and dining and for funerary and religious services, exquisite ware for the discriminating Tang court, and furthermore for clients from Korea and Japan to Egypt and Mesopotamia and to Southeast Asia and India. 1. See Liao Pao-Show, Empty Vessels, Replenished Minds: The Culture, Practice and Art of Tea, Taipei, 1982.